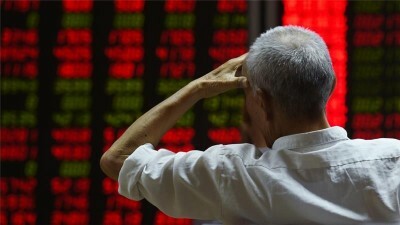 It’s officially Black Monday, if only in China for now. We warned on Friday, after last week’s China rout, that the market is getting ahead of itself with its expectation of a RRR-cut by China as large as 100 bps. “The risk is that there isn’t one.” We were spot on, because not only was there no RRR cut, but Chinese stocks plunged, with the composite tumbling as much a 9% at one point, the most since 1996 when it dropped 9.4% in a single session. The session, as profile overnight was brutal, with about 2000 stocks trading by the -10% limit down, and other markets not doing any better: CSI 300 -8.8%, ChiNext -8.1%, Shenzhen Composite -7.7%. This was the biggest Chinese rout since 2007. Turning over to this week’s calendar now. It’s a very quiet start to the week today with no data due out this morning in Europe and just the Chicago Fed’s national activity index this afternoon. Tomorrow is set to be busier though and in particular there will be much focus on the final reading for Q2 GDP in Germany along with the IFO survey and trade data. In the US we get more housing data with the S&P/Case Shiller house price index, July new home sales and FHFA house price index. The flash composite and services PMI’s are also due along with the consumer confidence reading and Richmond Fed manufacturing activity index. We start in Asia on Wednesday where we get Japan PPI and China consumer sentiment data. There’s nothing of note in Europe on Wednesday while in the US there’ll be much focus on the durable and capital goods orders data for July. In Europe on Thursday we’ll get UK house price data along with various confidence indicators out of France. The afternoon session is particularly data heavy in the US with the second reading of Q2 GDP and Core PCE likely to be front and centre, while pending home sales and the Kansas City Fed manufacturing activity index are also due. Closing out the Asia session on Friday will be Japan CPI and retail sales, along with China industrial profits and conference board leading indicators. It’ll be a particularly busy end to the week in Europe too where we get French PPI, German CPI, UK Q2 GDP and Euro area confidence indicators. It’s also a busy end in the US where we get the PCE core and deflator readings for July, personal spending and income prints and finally the University of Michigan consumer sentiment print for August.